Maor Tzur: The small camera of Daniel Ambash's partners records everything, even their own interview with Chanel 10’s cameras. Why? Aderet Ambash : I have been living with the wonderful Ambash family for 18 years. We always used to document our lives, even when we were at home. But lately our small camera has become our weapon against media disinformation. M.T: And now the four partners of D.A are asking the Prison Service to allow each one of them to have conjugal visits with him, each one separately as the Torah recommends. And also together? Shiran Ambash: We are friends and our partner is our commun friend. Our story is a special story. I will not only fight for my right to visit my partner, Aderet is also Daniel's partner, Azamra is also Daniel's partner and Ilana is Daniel’s first partner. So the four of us should certainly ask four conjugal visits. M.T: And don't you mind if an other women is alone with your partner? Aderet: Each one of us has a good reason for wanting to be alone with Daniel. I am 45 now. I don't know how long I still can have children. They made me barren. M.T: The story of Daniel Ambash's polygamous cult exploded seven years ago. Police raided the family's homes in Jerusalem and Tiberias and arrested him on suspicion of sexual offenses and abuse. The court convicted D.A of sadistic abuse on women and children, including beatings and sexual offenses. Today, after seven years, most of his partners still live together, still consider themselves "married", still love him. And still claim the police sewed a false case against him with false accusations. Aderet: They tried to base the entire Ambash case on a comparison with guru Goel Ratzon’s case. It's a very absurd way of proceeding. In our case they succeeded to produce false witnesses by applying very harsh pressure in the interrogation rooms, using threats, blackmailing and violence. M.T: Lawyer Rely Avisar represents the partners of Daniel Ambash. Lawyer Rely Avisar: The State refuses the fact a man maintains constant relationships with several women. It reinforces the idea he must have created a kind of a cult with brainwashed followers. The State can not believe non brainwashed women would choose such a non normative and non established way of life. But no one bothered to ask the women their opinion or their point of vue about it, which is a duty. M.T: According to the women, it’s a matter of freedom to choose how to live. As far as they are concerned, the court and the Israeli society has not yet realized that this was their free choice. Shiran: It's our life, it's not some kind of fling. This world is a world of choice. God did so, that man has a choice. A person should be responsible for his actions. And I choose to share my life and my partner with my best friends. Every one, when he finds his beloved one says there is no one like her, no one like him. That's how it came out. It just happened our union is one with four. By chance it just turned out like this. And people have to take it in consideration. M.T: Today, the women claim that the Prison Service should allow them to visit Daniel Ambash (simple visits & conjugal visits). Visits are a basic right. Some want to give birth to children. And because they used to live polygamously, the women demand the right to maintain the special character of their relationship. And to allow the four of them to visit him. M.T: What does the Israel Prison Service answer? Yes, the Prison Service told us that a prisoner is entitled to receive conjugal visits from his permanent and common-law partner. But it's important to have in mind that conjugality is a benefit and not a vested right. 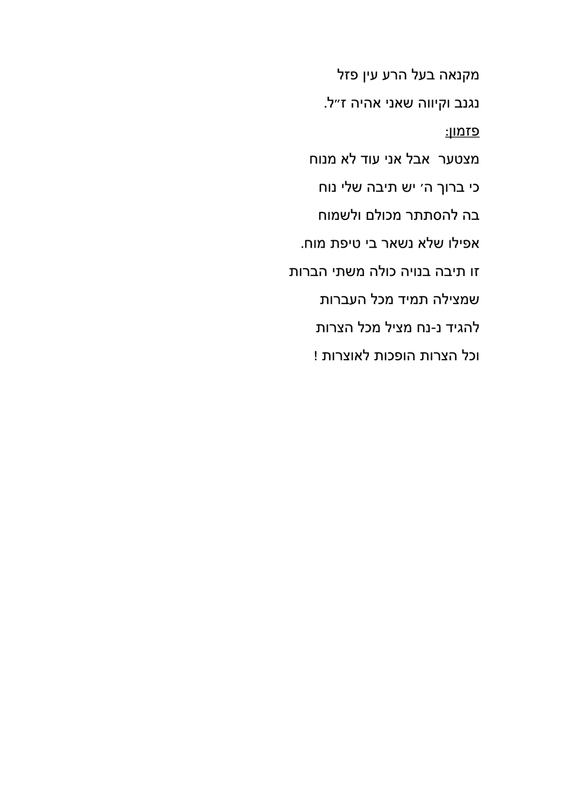 Unofficially, senior officials of the Prison Service estimate that the request of the four women will be rejected, which will probably lead them to court, and this will certainly be an interesting debate..
נשות גואל רצון VS נשות אמבש / דו קרב ! בואו לראות יש מכות ! סרבתי לשקר ולהפוך לעדת מדינה נגד חף מפשע ומצאתי את עצמי בכלא עם כתב אישום פלילי. עדי מדינה / תיעוד מצמרר - איך ניתן להפוך כל אדם לעד מדינה ?! Kangaroo Trial is a documentary film about an Israeli trial. What is a "decent society"? Do women, in the State of Israel, have the right to chose their own way of life? Produced in 2017 by R2DIP, a European Association - thanks to the International Support Committee to the Artist Daniel Ambash and to the International Support Committee to the teenager Israel Ambash - this video raises important questions . It also denounces, with supporting evidences, a trial based on false testimonies violently instigated by the Israeli authorities (police, welfare, prosecutors) along with a media lynching. Kangaroo Trial, film documentaire, a pour sujet un procès israélien. Qu'est qu'une "société décente"? Les femmes ont-elles le droit, dans l'État d'Israël, de choisir leur propre mode de vie? Produite en 2017 par l'association européenne R2DIP - merci au Comité International de Soutien à l'artiste Daniel Ambash et au Comité International de Soutien à l'adolescent Israel Ambash - cette vidéo soulève d'importantes questions . Elle dénonce aussi, preuves à l'appui, un procès fondé sur de faux témoignages violemment incités par les autorités israéliennes (police, services sociaux, procureurs) parallèlement à un lynchage médiatique. Shiran Ambash : It's really not our story ! Aderet Ambash: We'll stop you right now, it wasn' t at all like this… it was just the opposite ! Amnon Levi: Poor Daniel, how did he manage with all of you ? …Interesting ! interesting ! and incomprehensible to me ... You are charming, I must admit, and you really don't look like battered women ! ... I wish the phone call will be from who you expect it to be. And that your truth will be the one the Supreme Court will adopt. Should a man living with 6 women get out of prison? Shiran, Daniel Ambash's sixth wife : "They tried to humiliate us calling us slaves". Daniel Ambash has been jailed for six years because he married six women (halachic weddings not civil registered weddings). Shiran Ambash, his sixth wife, claims he is innocent and calls for his release : "We decided to live this way because of love"
Ambash Ladies interviewed on Israeli TV (Aroutz 1), news prime time, July 2016, two weeks before Daniel Ambash's appeal. -Ambash Ladies/ Professor Esther Herzog, expert in Social Anthropology and feminist activist. נשות אמבש: השופט צבן האמין לעדת מדינה : "הכנסתי נחשים ועקרבים לאיבר המין שלי" סרטון סאטירי, 2016 יוטיוב. Rachel Lichtenstein, director of "Israeli Center for victims of Cult" (ICVC-FECRIS) requested to censor / delete from youtube the satirical videos of the Ambash Ladies pretending the copyright belongs to her ! Satyrical video, 2016. Ambash Ladies in Mamila; someone is brainwashed? ישראל כיום בטיפול מפוסט טראומה שחווה החל מיום מעצר אביו וכל בני משפחתו ב-4 ליולי 2011 דרך לחץ אלים בחדרי חקירות משטרת ישראל, מכות שוטרים, אלימות ואיומים קשים מעובדי רווחה, ניתוק טוטאלי מכל משפחתו, הסתה מכוונת ואיומים על חיי משפחתו ע"י פרקליטים מושחתים (ליזו וולפוס ושגיא אופיר מפרקליטות מחוז ירושלים) בכוונת זדון ליצירת עדות שקר מפיו להרשעת שווא נגד אביו החף מפשע דניאל אמבש. סדרת הסאטירות שמעלה ישראל ל-youtube הם כחלק מטיפול פסיכודרמה שבו הוא ממחיז את שעבר עליו במציאות מגורמים מושחתים במדינה. במערכון זה ניתן לראות את ד"ר טניה שכטר מבי"ח פסיכיאטרי איתנים מקבלת הוראות מליזו וולפוס פרקליטת מחוז ירושלים לחיסול ישראל אמבש מכיוון שהראה סימנים שבכוונתו לחזור בו מעדותו השקרית נגד אביו שנתן תחת איומים מסיביים ושקרים של הפרקליטים המושחתים שגיא אופיר וליזו וולפוס. נשות אמבש: מה קרה לילדים שנלחמו על חפותו של אביהם דניאל אמבש? 2016 יוטיוב. Rachel Lichtenstein, director of Israeli "Center for victims of Cult" (ICVC-FECRIS) requested to censor / delete from youtube the satirical videos of the Ambash Ladies pretending the copyright belongs to her ! נשות אמבש בסדרת המערכונים הסאטירים בתגובה לשרשרת כתבות הדיבה שגרמו להרשעת חף מפשע ולחורבן בית משפחת אמבש. פרטים נרחבים,סרטים,סרטונים,realty TV, כתבות, מכתבים, הופעות בלוג ועוד באתר הבינלאומי: WWW.DANIELAMBASH.INFO האישה השניה של דניאל אמבש, היתה נשואה איתו 15 שנים ומיום מעצר המשפחה ב-4 ליולי 2011 העידה לטובתו בחקירות המשטרה ובבית המשפט ונלחמה למען הוכחת חפותו במשך 3 שנים, עד למועד גזר הדין הנפשע ל-26 שנות מאסר; אז החליטה לעזוב, לשלוח שליח לגירושים מס' 7, (סיפור אמיתי) וניתקה קשר עם נשות אמבש ודניאל. Daniel Ambash's second partner, E. (56 years old, 5 children, only 1 child with Daniel Ambash) lived 16 years with him, then she worked for his defense for the 2 years following his arrest., E. was claiming Daniel Ambash is innocent, that she has grate love and recognition for him. (Read her lettrers, rubric: LETTERS AFTER ARREST). In April 2013, E. testified in court as a defense witness. Since July 4th 2011 (day of arrest) till october18th 2013 (day of sentence), 5 out of 6 Ambash Ladies were fighting to clear Daniel Ambash from his charges. One months after Daniel Ambash was sentenced to 26 years in prison, E. divorced and cut all relationships with the 4 other partners: Ilana, Azamra, Aderet, Shiran. Today E. is spreading gossips against Daniel Ambash and his 4 faithful partners, the 'Ambash Ladies'. She is Looking for the 8TH husband. E. la deuxième partenaire de Daniel Ambash (56 ans, 5 enfants dont 1avec Daniel Ambash) a vécu 16 ans avec lui, puis a travaillé à sa défense les 2 ans qui on suivi son arrestation. E.
clamait l'innocence de Daniel Ambash, son amour et sa grande reconnaissance à son égard (Lire ses lettres, rubrique: LETTERS AFTER ARREST). En avril 2013, E. a témoigné comme témoin à décharge. Du 4 juillet 2011(jour de l'arrestation) jusqu'au 18 octobre 2013 (jour de la sentence), 5 sur 6 compagnes Ambash se sont battues pour que Daniel Ambash soit innocenté des accusations portées contre lui. Un mois après la condamnation à 26 ans de prison, E. divorce et rompt toutes relations avec les 4 autres partenaires : Ilana, Azamra, Aderet, Shiran. Aujourd'hui E. se répand en médisances contre Daniel Ambash et les 4 'Ambash Ladies' demeurées fidèles. Elle est En quête du 8ème mari. Transcription, E. dit: Daniel est reconnu coupable mais tout était vendu d'avance. Ils n'ont aucune preuve, ils reconnaissent qu'il n'y a aucune preuve ni aucune confession. Tout est inventé, ils ont fabriqué de fausses accusations. Ils ont incarcéré un innocent avec un coeur et une âme plein d'amour. Chacune d'entre nous, ici, ressent et sait qu'elle est une reine. Nous sommes indépendantes! Regarde-nous. Chacune a choisi ce qu'elle voulait pour sa propre vie. Comment expliquez-vous le fait qu'après 15 ans de vie commune, ils l'enferment, le torturent et nous aussi nous avons été battues et torturées. Ils l'ont jeté dans une cellule et durant 3 semaines nous ne savions rien de ce qui lui arrivait. Ils ont agi de façon très choquante. ...Que s'est-il passé quand les docteurs pronostiquaient que je ne survivrai pas à mon cancer? Et bien, après 3 ans, je suis tombée enceinte, Dieu merci. Et nous avons eu un garçon très doux. Jusqu'à aujourd'hui il pleure et il veut voir son père. Il écrit des lettres à son père... il lui envoie des photos. Mais la prison ne m'autorise pas à les lui remettre. Ils veulent cacher le fait que mon fils désire voir son père. Il pleure et demande pourquoi son père est là-bas. Son père lui manque. Il a envie d'être avec lui. Il veut vivre avec lui. 1990, Rabbi Israel Dov Odesser שנת 1990, רבי ישראל דב אודסר.